These are now a Good-buy! 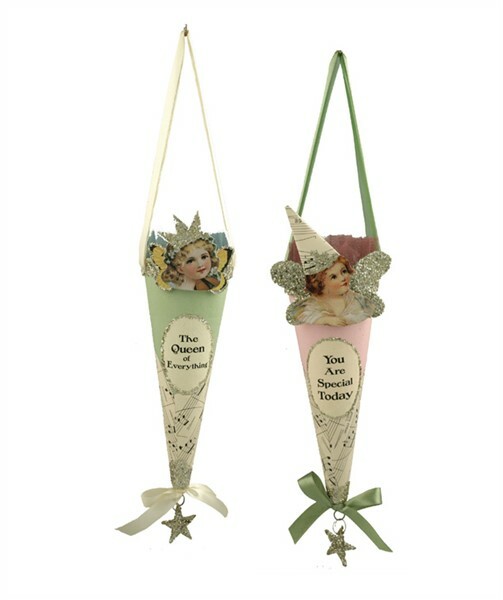 Surprise a friend on her birthday with a vintage style birthday cone filled with flowers, candy or a small gift. Made of paper, ribbon, glitter and tissue. They are approx 10" x 4.25" x 3.25". The green says "The Queen of Everything" and features a butterfly girl with a glittered crown. The pink says "You are Special Today" and features a glittered fairy wearing a party hat. A ribbon bow and a hanging glittered star are on the bottom of the cone.